In Yosemite water is its life blood. 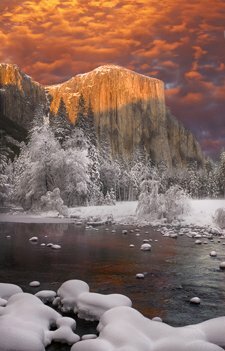 During winter the park is quiet while clothed in deep snow, but it is just a matter of time before the warmer temperatures of spring bring Yosemite Valley back to life. As a little boy growing up in the valley, I remember how the sun rose higher in the sky and the days began to warm after the long cold winter freeze. 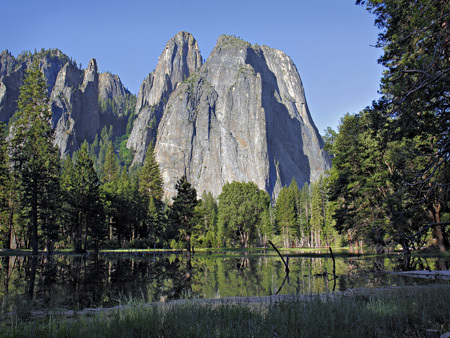 It was now that a transformation took place in Yosemite Valley. Meadows began to “green” and the newest batches of animal babies started to appear. 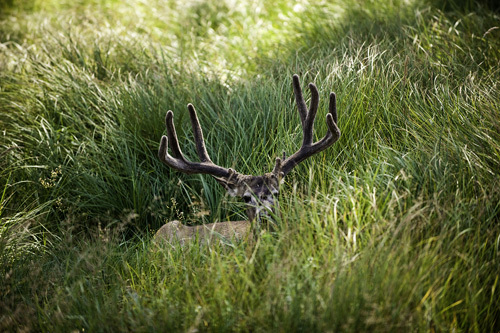 The mule deer buck's new antlers were still “in velvet”. Mother bears with their cubs and the raccoons with their little ones were soon looking for an easy meal wherever it could be found. For those of us living in the park, our trash cans were the most frequent target. If something especially tantalizing had been thrown out the night before, (unlike the raccoons who would conduct a more surgical strike), the bears would just “bulldoze” the can. 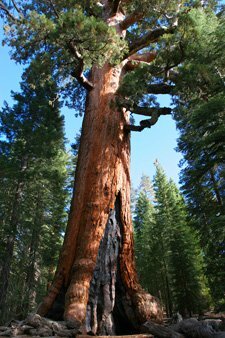 Having been born in Yosemite myself, I looked forward to seeing the new babies every spring as though they were my own newborn brothers and sisters…If our garbage was what brought them around, the clean up afterwards was worth it to me. There was one unmistakable indicator that spring in Yosemite had actually finally arrived, and it was the steadily increasing flow of water that began “booming” over Yosemite Falls. 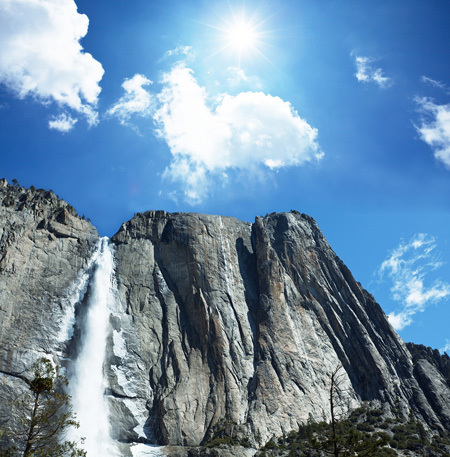 The three falls that comprise Yosemite falls were always the first in the valley to come back to life. 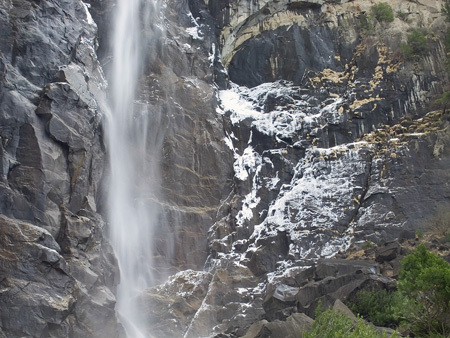 Situated on the sunny warmer north side of the valley, the snow fields in the high elevations above Yosemite falls began their melt and runoff before any other. The water from the previous winters melting snow deposits, which lay deep upon vast granite surfaces, had only one place to go. 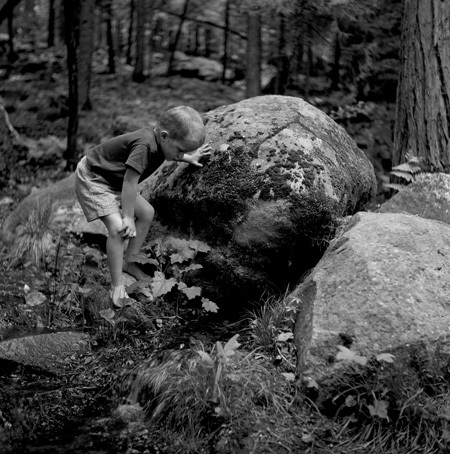 Little was absorbed by the rocky ground. 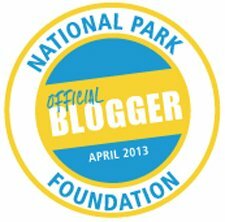 Mine was a National Park Service family. Living less than a mile from the base of Yosemite Falls, readjusting to the rumble from its reawakening always took a little time. But before long we would become so accustomed to being surrounded by the new sounds of spring that we had to make an effort to notice them at all. I loved the streams that “spider-webed” their way from the valley walls. I spent most of my summer days in the forests where I would often find new deep hollows in the creeks gouged out by the spring’s heavy runoff. It was there that I could find frogs, and if I was really lucky maybe something unexpected. But none of that was going to happen in the spring. People drowned in these swift waters and I knew it! The streams this time of year showed the effect of the melt in the high country, and I often wondered what kept the little animals that I found living there later from being washed away by it. The snows that remained from the winter, hiding in their shady pockets on the valley floor, added what they had to the volume of water as the sun rose higher and they too begin to melt. On the cold and dark south side of the valley, there were places that existed in the permanent shade of the towering granite walls above. Snow remained here well into the summer untouched by the sun, until the rising summer temperatures finally melted it. The water run-off eventually found the Merced River. The rivers icy cold waters flow over Nevada Falls and then Vernal Falls as they enter the valley. Dropping down many thousands of feet in elevation from the mountains in the high country, “the Merced” flows steadily westward. Summer temperatures did not warm the water of the Merced River and any swimming that we wanted to do required a running start! The result was always a massive “brain freeze” and shivers for the effort! With the water volume from an average winter’s melting snow fall, “the Merced” reaches capacity and eventually rises over its banks in some low lying areas. It contributes its excess water to the temporary formation of large ponds, in the lowest areas of the grassy meadows along the valley floor. The dampness this water leaves behind encourages the various wildflowers that will later fill the meadow. 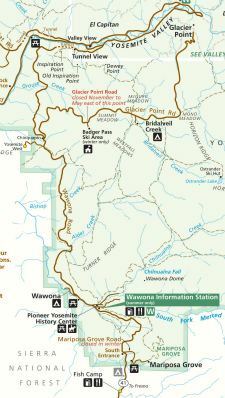 Considering the inescapable presence of water everywhere in Yosemite, it should come as no surprise that it has been the action of this water, (both as water and as ice), that has formed the thousands of square miles that is Yosemite National Park. 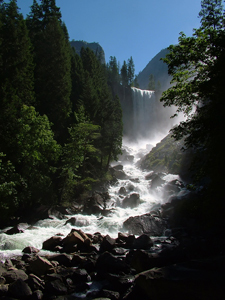 The water of the Merced River has been one of the primary agents of change in Yosemite. Flowing for many thousands of years from its sources high in the mountains down great slopes and at high speed, erosion took place here more rapidly than with slower waters. 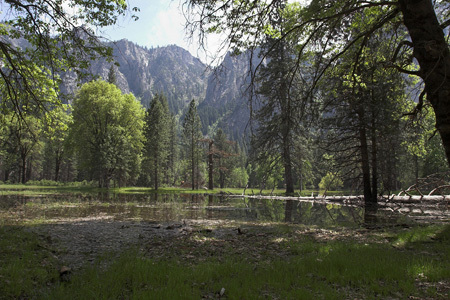 The proof of this is inescapable as the Merced River today follows its course over 620 feet below where the smaller and slower Bridalveil creek drops into the valley as Bridalveil Falls. They once both existed at the same level! 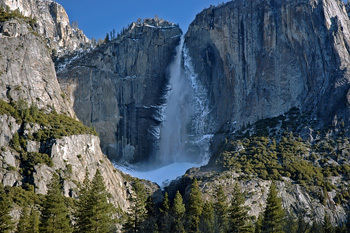 Ice is the other form of water that continues to play a major role in the ongoing transformation of Yosemite. The gouging and scouring action of vast sheets of frozen water in the form of ancient glaciers have left their unmistakable signs everywhere. Water and ice are also responsible for the weathering action of Yosemite’s rock faces, where water seeps into the cracks of the rock and then freezes, expanding as it becomes ice. Over time, this wedging can break massive layers of rock away from the valley walls. It is another powerful geological force at work today. The Royal Arches behind the Ahwahnee Hotel is an example of this type of weathering in action. The sights and sounds of massive crashing “rock falls” in Yosemite is a reminder to a person of really how small and insignificant they are, (just in case they had somehow forgotten)! The majesty and movement of Yosemite’s water instills a sense in a person that somehow this place is a living thing, and the massive rock formations support this feeling. It is recognized that water is constantly working on the geology that supports it where ever it is on this earth. 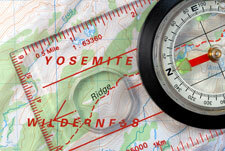 If this is true, then why are there no other “Yosemite’s”? The answer is in the unique composition of Yosemite’s granite rock . During summer vacation, I would lie in the warm grasses and watch the red tailed hawks soaring far above me. Eventually they would land at their nests on the valley walls. Often during those long and lazy days watching the hawks, I would wonder about the strange and wonderful shapes of the rocks. Little did I know then that the internal characteristic of the granite…its composition, grain size and chemistry, determined what rock remained after forces had sculpted the other rock away. Where the rocks were too strong to be fractured the action of the water could not erode them, and the massive rock outcroppings and domes that we associate with Yosemite emerged. 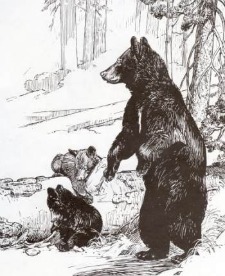 My father was the Chief Park Naturalist in Yosemite for almost 15 years, and with forest all around us, Yosemite's animals were a regular part of our lives. 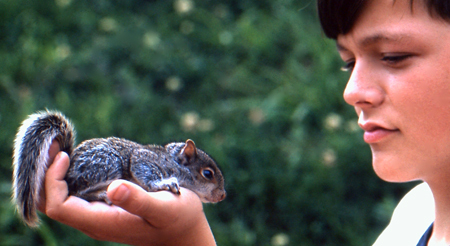 Since park regulations did not allow cats or dogs to be kept, the wild animals were our “pets”. 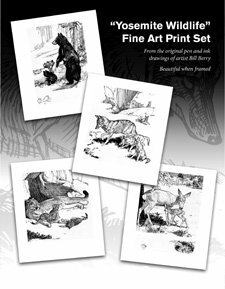 Spring was when the animals would re-emerge from their dens, hungry and looking for food after a long winter. Much to my mother’s unease, snakes were often captured over the years and brought into the house to live with us. (As a rule, she was more enthusiastic about the “furry and cute” animals that we kept). As much as she would like to…she will never forget the day when a big garter snake we had named “Christopher” escaped from the aquarium that had been his home. As I recall, he had been given his name because like his namesake Christopher Columbus, he liked to explore. Exhaustive searches turned up no Christopher anywhere. After a while we accepted the fact that he had somehow found his way outside. That was…until the day of my mother’s bridge party. Fortunately for us kids, things could have ended up much worse than they did. With all of the “wildlife” living with us in the house, Mom had become very good at spotting things that were out of place. With the numerous rattlesnakes that we encountered every summer, she was especially accomplished at spotting snakes. She did her best to remain unflustered while serving as the perfect hostess that day, with a careful eye constantly on Christopher. He was coiled up and happily asleep beneath the chair of the Park Superintendents wife! Mom was the only one who noticed him and nothing disturbed him from his sleep. Christopher was released back to the wild that same day, immediately after the last guest had left. 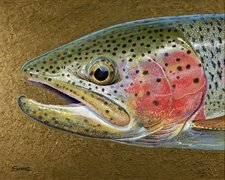 To return to the Home Page from Yosemite Water please click here. 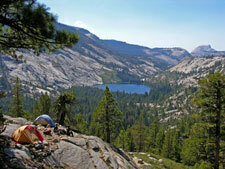 Hike And Fish The Yosemite High Country! 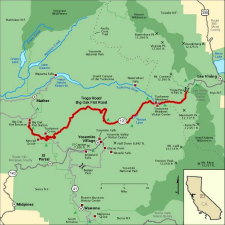 Visit the Yosemite High Country In Your Car!